After traveling 75 million miles since its launch last May, NASA's InSIGHT spacecraft is scheduled to land on Mars on Monday, November 26 around noon, Pacific Time. NASA TV will cover the adventure as a livestream. Trust me, you do not want to miss this spectacle. The last landing on Mars was six years ago, by the rover Curiosity. The next will not be until at least 2020, so InSIGHT's upcoming entry, descent, and landing is a rare opportunity to witness a hair-raising plunge into unexplored extraterrestrial territory. If you have forgotten how thrilling this can be, let's refresh. First, the spacecraft hits the thin upper atmosphere 80 miles above the surface at over 12,000 miles per hour, striking heat-shield-first in a fiery reentry burn. From this point until it sets down safely on the ground--a period of about six minutes--InSIGHT must successfully perform a serious of pre-programmed actions, without any assistance from people back on Earth. These include the ejection of its heat shield, the deployment of its supersonic parachute, followed later by the deployment of its secondary, sub-sonic parachute, and finally a retrorocket-thrust-assisted soft landing. In the past, ground control on Earth had to wait until after landing even to get the "successful touchdown" ping from the spacecraft, and hours longer for the robot to relay the landing telemetry data. 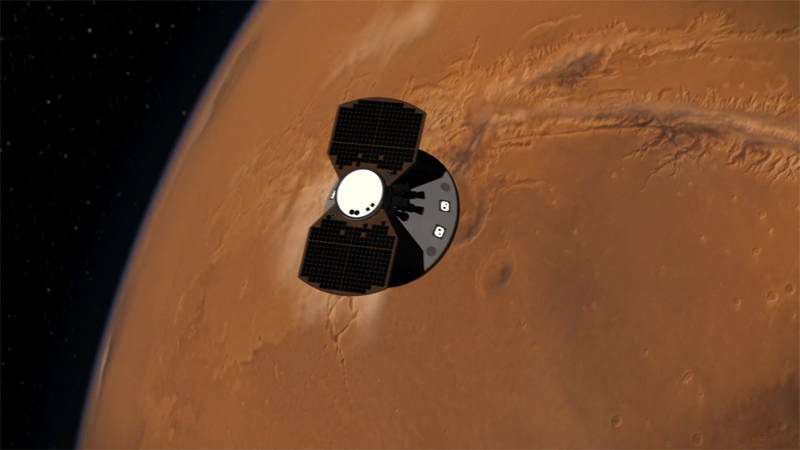 InSIGHT's descent, however, will be monitored by two miniature "cubesat" spacecraft, MarCO, that were launched with it and have followed along to Mars to relay the telemetry even as the spacecraft descends. All the robotic landers and rovers before InSIGHT set out to see the sights and scratch the surface rocks and soils of Mars, from the Viking landers in 1976 to the Curiosity rover in 2012. Their scientific goals were focused on the search for water, indications of life and clues to the planet's past environment. The results of their investigations have been exciting: turning up signs of liquid water present today, and evidence of ancient precipitation, surface flows, deep lakes and wide seas of liquid water that paint a picture of a primordial Mars much more Earth-like, and potentially life-friendly, than the cold dry desert it is today. What is InSIGHT Looking For? 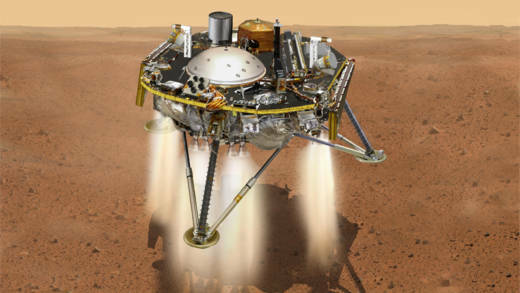 InSIGHT (an abbreviation of Interior exploration using Seismic Investigations, Geodesy, and Heat Transport) is similar in design to the Phoenix lander, which set down in Mars' extreme northern polar region in 2007 to investigate a vast reservoir of water ice detected from orbit. The lander is 5 feet long, 3 feet high and weighing 789 pounds. Its twin fans of solar panels, when deployed, span almost 20 feet. But InSIGHT's scientific goals are very different from all past Mars landing missions. Employing an instrument suite that includes a seismometer, a ground-penetrating temperature probe, and Doppler radiowave measurements, InSIGHT will investigate the interior structure of Mars, giving us a glimpse as deep as the planetary mantle and core. 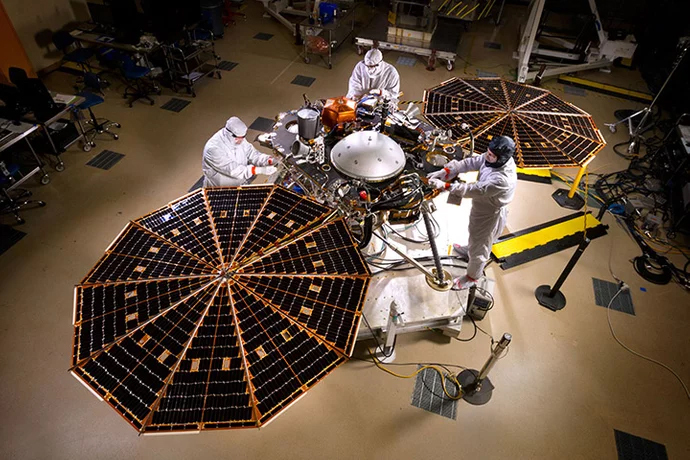 But InSIGHT's mission goals go beyond divining the internal structure and distributions of material within Mars. More broadly, scientists seek to understand how Mars, and by extension all of the solid terrestrial planets (Earth, Venus, and Mercury included), originally formed over five and a half billion years ago—under the assumption that they all formed under similar conditions and processes. 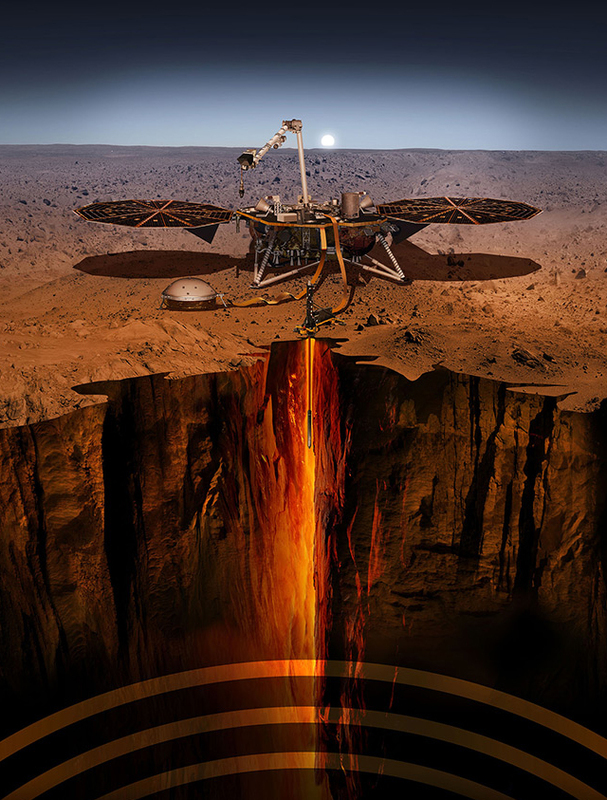 InSIGHT's seismometer, which will be placed on Mars' surface with a robot arm — like a doctor's stethoscope placed on a patient's chest — will listen for seismic waves traveling through the planet's interior. The tremors may be created by Marsquakes, meteorite impacts, or other weighty shifts of material. How those shock waves travel through Mars will let scientists piece together a sort of "sonogram" to probe structures and densities of Mars' interior. A ground-penetrating probe will bore downward through several meters of soil, pulling behind it a string of temperature sensors that will measure how quickly, and how much, heat is escaping from Mars' interior. This data can provide insight to the thermal state of Mars' core — how much heat remains from its original formation five billion years ago, and how much it has cooled and solidified since then. Finally, an experiment known as RISE that measures the Doppler shift of InSIGHT's radio transmissions back to Earth will detect very tiny variations in Mars' rotation: small wobbles and perturbations that can indicate fine details of internal structure. This is something like how a washing machine in the spin-dry cycle may vibrate or "dance" because of an imbalance in the laundry load. The frequency and degree of wobbling depends on the distribution of the wet spinning laundry. InSIGHT will also have a camera. Even though its main mission is to probe Mars' interior and understand how all the planets of the inner solar system originated, people back on Earth might be upset if we don't get to see pictures of the surrounding landscape, even if it's plain and flat. The camera will also help guide the placement of the seismometer and thermal probe. 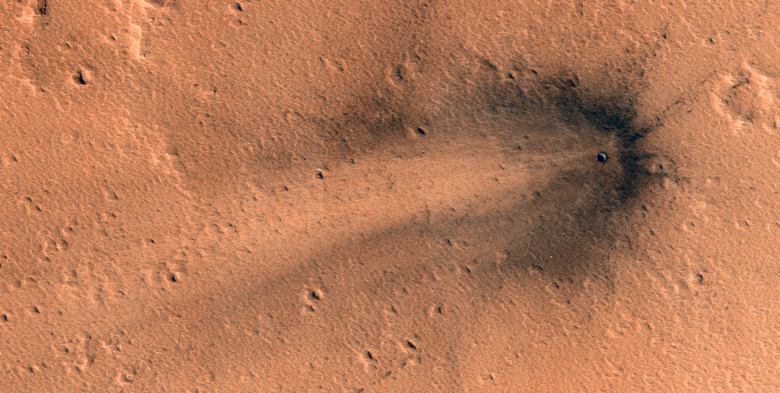 So, what landing site has NASA chosen? With such different scientific objectives than its predecessors — the Vikings, Pathfinder, Spirit and Opportunity, Phoenix, and Curiosity — you might expect InSIGHT's destination to be as unique and exotic as its deep-probing mission. Let me turn the question around for a moment. If you were a Martian sending a robotic lander to Earth, where would you choose to land: Yosemite, or the great flat expanse of the Atacama Desert? While Yosemite would be a great spot for taking breathtaking panoramic landscape pictures, if your goal is to probe the interior of the planet, it doesn't really matter where you land. In this case, you might be wise to choose as bland, flat, uninteresting—and safe—a spot as possible. And so, NASA has chosen the wide, very flat, very humdrum landscape of Elysium Planitia to set InSIGHT upon, with much less concern for landing hazards like big rocks, hills, pits, and slopes than in Mars' more rugged sightseeing spots. At the moment there is only one functioning robot on Mars: the Curiosity rover, which is exploring the spectacular landscapes of Gale Crater and its central Mount Sharp looking for signs of past water — and finding plenty of them. The rover Opportunity, which last June went into a power-saving "sleep" mode in response to a major global dust storm, has not been heard from since. InSIGHT will return Mars' active robot population to two. In two more years from now, the count will bump up to three for the first time in history with the landing of the Mars 2020 rover, on its mission to look for signs of past Martian life.